As we’ve read a lot about in this series, there is a huge amount of opportunity for companies to capitalize on underutilized crops from around the globe that are full of flavor, beneficial for health and support local ecosystems and communities. KAIBAE is a beauty and nutrition company doing just that. KAIBAE works directly with indigenous communities to bring plants like Baobab, Cacay and Seaweed to the US market through its powders, teas, oils and beauty products. 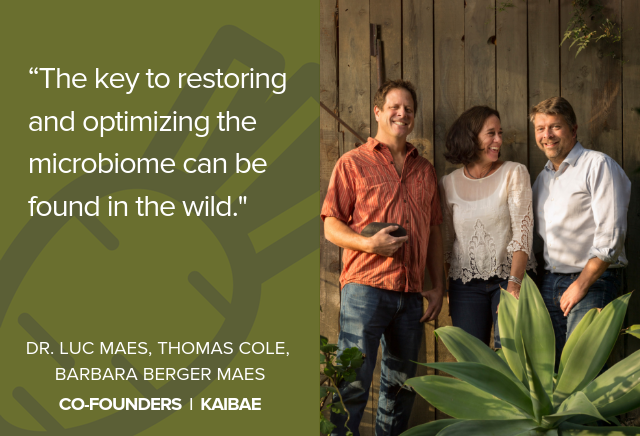 Below, I speak with KAIBAE co-founders Dr. Luc Maes, Thomas Cole and Barbara Berger Maes about revaluing “Lost Crops,” establishing supply chains for biodiverse ingredients and how biodiversity is tied to our microbiome. Danielle Gould: Is biodiversity a priority for KAIBAE? If so, how and why? KAIBAE: Absolutely! KAIBAE recognizes that biodiversity is essential to human wellbeing and the long-term health of the environment. Modern living, urbanization, pollution and deforestation continue to threaten and degrade biodiversity in both the human and global biome. We have biodiversity in mind with everything we do. KAIBAE revalues Lost Crops, wild plants once neglected for their health and economic potential yet important to the vitality of their ecosystem. They have a vigor not found in commercially farmed plants thanks to biodiversity in the soils and the environment in which they grow. It is that vigor, the wild intelligence that is captured in KAIBAE health and beauty products, that we regard as essential to a balanced microbiome inside and out. DG: How does KAIBAE define and think about biodiversity? KAIBAE: Biodiversity refers to interconnected and symbiotic relationship between plants, animals and humans down to the microbiota that shape an ecosystem. Every ecosystem is uniquely important to the vitality of the global biome, and the vitality of the human microbiome – in essence our gut – is directly related to the wild nature of our surroundings. The key to restoring and optimizing the microbiome can be found in the wild. Community members in the Amazon and the African Savanna show a greater diversity of healthful microbiota in the gut and the skin. This is attributed to the biodiversity in their environment and a diet and skincare regimen of wild plants, such as Baobab (Adansonia digitata) or Shea (Vitelleria nilotica). These are plants uniquely rich in prebiotics and antioxidants. Research shows that a lack of green space, plants and animals in our life depletes the human microbiome and compromises our vitality on mental, emotional and physical levels. Microbiome imbalance is associated with depression, anxiety, sleep problems, skin, immune and digestive disorders. DG: What does an ideal biodiverse food system look like? KAIBAE: An ideal biodiverse food system is holistic, is regenerative to the soil, builds upon existing indigenous crops and encourages local community development as a critical part of any food supply chain. A biodiverse food system extends all the way from the soil to the food that is on the store shelf. Biodiversity goes a step beyond functional nutrition for human health – linking the importance of biodiversity for wellness of both people and planet. This is the next generation of total well being that recognizes the importance of this symbiotic relationship. KAIBAE: Our goal is to identify more plant species and other Lost Crops in diverse ecosystems, as we have done with Baobab in the African Savanna, Cacay Nut in the Amazon and Kappaphycus seaweed the Indian Ocean. The core of our work has been to establish sustainable harvests, develop solid partnerships with local communities and create products with enduring benefits to health and beauty. Central to this is our mission to educate the consumer that their food, skincare and packaging choices have implications beyond their own health, that their choices can help contribute to the health of communities around the world and the preservation of global biodiversity. KAIBAE: Investments in time, money, research and compassion need to be made at many levels. Creating a more biodiverse food system requires a deep understanding of plants, ecosystems and health, as well as knowledge of the natural products market. As a Naturopath with 30 years of experience in a private practice, Luc began KAIBAE with unique insight into the needs of his patients and healthcare trends. His continued studies into medicinal plants took him all over the world, but he was inexplicably drawn to the Baobab tree, its fruit and the communities who have been utilizing it for centuries. Thomas brings indispensable expertise in community and agricultural in Africa to our team. His skills and experience have been key to developing supply chains that support local livelihoods and promote environmental stewardship in regions where natural resources are abundant and poverty is widespread. Developing a more resilient food system demands investment in harvesting partnerships that benefit everyone involved. In the food system of the future, all people must have access to food that supports good health and opportunities to participate in its production. Five years ago, we established our supply chain in Northern Ghana, with the goal of harvesting Baobab in a way that empowers local communities, protects biodiversity and delivers high quality, healthful ingredients to consumers. Significant time and financial investment also went into building a processing center and study the feasibility of scaling a harvest. DG: What are the greatest challenges and opportunities KAIBAE faces for creating a more biodiverse system? What are you doing to overcome or capture them? KAIBAE: Careful understanding the scalability of a wild-harvested crop; understanding local community needs; understanding the demands in the market. Six years ago Luc recognized the prebiotic benefits of Baobab and now Baobab is gaining more market interest because of its benefit to the gut and skin. This gave us the opportunity to solidify relationships on the ground, ensure readiness to scale, understand the food industry and partner with values aligned consumer packaging companies. KAIBAE: Over the past five years we’ve learned what it takes to develop a scalable supply chain for an untapped ingredient such as Baobab — from establishing community partnerships to standardizing harvesting and processing procedures to producing a quality ingredient that meets US food and beverage industry regulations. Equipped with this experience, we are applying our model to ingredients in other parts of Africa and South America, where we carefully study how we can work alongside communities to establish a sustainable harvest that is conscious of local traditions and does not pose stress to people or the earth. Understanding the environmental conditions, social dynamics and economic needs in the communities we partner with is key. We also continue to research medicinal plants with remarkable benefits to health, local livelihoods, and the environment, and the potential for scalable supply chains. Through 5 years of experiencing working directly with communities, the KAIBAE team understands what it takes to source and scale ingredients in developing countries. KAIBAE: While the word biodiversity might be new to the consumer, the concept of buying foods that are better for health & the planet is not. The use of probiotics and their importance to promoting diversity in the gut microbiome is increasingly accepted and sought-after. The next step is to make the consumer aware that their food and skincare choices also affect the biome of the earth. KAIBAE: KAIBAE sustainably supplies Baobab Fruit Powder, Baobab Oil and Baobab leaves to the food and beverage industry. Food manufacturers can support biodiversity by including these ingredients in their offerings. Retailers can support biodiversity by choosing to include products made of ingredients that support biodiversity. Retailers need to educate their shoppers which can be done within the store. On the shelf, packaging can display a Biodiversity logo that the food products meets specific requirements. KAIBAE: Our vision for wellness is that health and beauty are not separate entities, that products are developed with this in mind through a regenerative lens and a process that gives back rather than takes from the earth. KAIBAE recognizes that biodiversity is the foundation for human health and the functioning of the ecosystems on which we depend for our food and fresh water; biodiversity aids in regulating climate, floods and disease. Biodiversity also contributes to local livelihoods, to both traditional and modern medicines and economic development. Biodiversity is at the core of Kaibae’s mission, our expertise, our stewardship and this long-term vision for growth. DG: Anything else you want to share? KAIBAE: KAIBAE’S work has been featured in Lost Crops, a documentary film. Lost Crops has been shown at many film festivals and most recently was at the United Nations Film Festival at Stanford University. If you would like to see the work we do with communities in Africa and South America you can watch the short film here. LOST CROPS is the story of a naturopathic doctor, a botanist-humanitarian, and a driving desire to make the world a better place. This film speaks to the power of revaluing Lost Crops as a means to link communities globally, conserve the environment, and create economic opportunity. We seek to bring a voice to Lost Crops, our partners who harvest them, and to share their ability to support human health across the globe. With 30 years of experience in plant-based medicine and the natural products industry, and as Director of the Maes Center for Natural Health Care clinical practice, Dr. Luc has an abiding interest and keen insight into understanding health and skincare, real consumer needs and best practices product development. His private research includes the study of medicinal plants throughout Africa, Central and South America. His public interest fuels his desire to take what he learns and share it in a global view towards solutions for people and the planet. With more than 25 years embedded in sustainable agriculture, human livelihoods, community development and humanitarian response work across Sub-Saharan Africa, Thomas is uniquely positioned to develop working solutions to every part of the supply chain. Currently at work as an agroecology and drought management advisor for global USAID food security programs, Thomas has a close-up perspective of the needs of these communities and the ability to create and build networks of opportunity for all. Aptly, Thomas is responsible for Kaibae supply chain management and community relations and is Dr. Luc’s trusted travel companion across the globe. With 30 years experience in advertising, marketing and business development, Barbara’s keen “eye” captures unique properties and experiences in health and beauty. Barbara’s journey includes work as a curator and project manager for the cities of Chicago and Portland’s 1% for the Arts Public Programs. 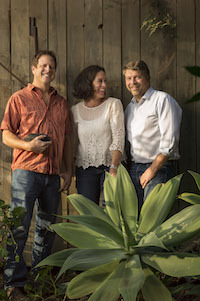 She manages the administration of the Maes Center for Natural Health Care in Santa Barbara alongside her husband, Dr. Luc and together they are a natural couple of global conscientious citizens. Barbara is responsible for new business relations, day-to-day operations and for content development for the Kaibae Lost Crops company.